After the chitchat, we invited Greg and his hosts the Chasin family, to come to the house to take a picture with the Mets statue. Greg had taken a picture hugging this statue when it was on display in Manhattan on Avenue of the Americas in 2008 prior to the auction to raise funds for the MLB charities. So tonight Greg and Liberty Shea were reunited. And finally, Greg posed for a picture wearing BF's Bambi's Bandits hat from 1982 in honor of George Bamberger - the Met's Manager and the bandits, or rather, reserve Mets who would steal the game. It's rare that you can share so much passion for a sport like BF and Greg do. Seeing them together was a rare treat. I've heard Greg's name for so long, it's hard to believe this was their first meeting in person. Hey there Knitters. This is just what you've been waiting for. The New York Mets are having their 2014 Stitch and Pitch on Sunday, September 14th at 1:10 p.m.
Join the Mets for the 8th Annual Stitch N' Pitch event at Citi Field! Sit together with family, friends, and fellow Stitch N' Pitch fans in discounted Left Field Landing seats. For the first time ever a we will be giving a Limited Edition 8" Mrs. Met plush doll to the first 1,000 fans who purchase Stitch N' Pitch tickets through this online offer! Who wants to go? You need to buy your tickets through this special in order to receive the Mrs. Met plush doll. Contact Thomas Vilanova or Carla SAnchez-Armora to buy your tickets for the September 14th day game. Won't it be fun? Last weekend was Stitch & Pitch day at Citi Field. Since BF and I are huge Mets fans, we bought four tickets for the group seating and made plans to attend the big day. Excited about Stitch & Pitch day, the plans got even better when we discovered it was also going to be Banner Day. After dinner the night before the game, BF asked me about the banner I was going to make. Feeling like a son had told me about a needed costume for school the next day, I quickly assembled a banner. Primogeniture even helped me make the blue i-cord on my French Knitting Spool. Fortunately, I had some special printer paper for making iron-on transfers. I copied pictures of Gary, Keith and Ron... and the judge Kevin and labeled them "A Tight Knit Group." The best part of Banner Day is getting to go on the field to be judged. It was great fun! Well, going on the field was the best part for any baseball fan. For the knitting fans, getting the special giveaway was the best part. 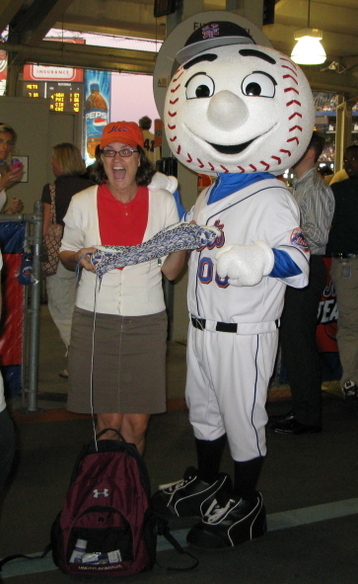 It was a Mr. Met bobblehead - KNITTING! Then we went to our seats in the Stitch & Pitch section to knit and watch the game. OK - I knit and the guys watched the game. Unfortunately, the Mets only advertised this event to regular Mets fans so there were only ten knitters/stitchers in attendance as far as I could tell. The rest of the fans were there for the bobblehead (which appears to be selling on ebay for $100 already). He's pretty cute, so I can see why they'd want to get one. I knit my pink socks and made great progress. Our seats were in the nosebleed section, and I'm afraid of heights, so I focused mostly on the knitting in my lap rather than watching the game far down below. It was very fun. Next year, if they host Stitch & Pitch again, I'll post about it earlier so we can get a larger representation attend. Let's Go Mets! My friend Virginia loves bulldogs. In fact, she currently has two Olivia and Jag, and was in heaven when she met Wilma. Actually, I think Wilma was the one who was in heaven. She loves it when people pay attention to her. In fact, she thinks that people come to the house to see her and only her. She really is a diva. This week Virginia stopped by with a gift for Wilma - her very own Mets doggy sweater. I think Wilma was meant for the runway! All worn out from trying on her new outfit. Awww - she even got a ruffly collar. So there you have it. We can hardly wait for the cold weather so Wilma can wear her new sweater outdoors. She just loves her new friend. What's not to like? Thanks Virginia! Each year BF and I go to a day game with our friend Judy to cheer on the Mets. It's a wonderful tradition and we truly enjoy every minute of it. We arrive by subway at Citi Field. We walk around and locate our brick outside. We wander around the stadium before the game and enjoy the best lunch in the house. We stand for the National Anthem (removing our caps, of course) and watch the ceremonial first pitch. This year that honor went to Olympic gold medalist Gabby Douglas. We hope Mr. Met will come near us for a picture (he didn't --- this was as close as he got). We take the traditional sock knitting picture before the game. And we wait for our favorite Met - David Wright to come to the plate. Unfortunately, we almost always watch the Mets lose. But we still go. We love our traditions. And we love our Mets. Let's Go Mets! We have a few themes on our Christmas tree. Baseball and the New York Mets make up a part of our tree. My first hand knit Mets sock ornament. One of BF's baseball cards. It's not a Met, but it's a pretty funny baseball card! A classic Mets glass ball ornament. 45 is Pedro Martinez' jersey. The 2011 striped Mets hand knit socks. Hmmmm. I'll have to start looking early for some new baseball ornaments for 2012. Have any ideas? Will you keep on the lookout for me? There was no way I could limit my choice of items to just one for the letter "S" - so stay tuned for daily posts for the next 2 weeks that all start with the letter S. Yes, I really did come up with fourteen unique and relevant posts. Anyway, remember this post? 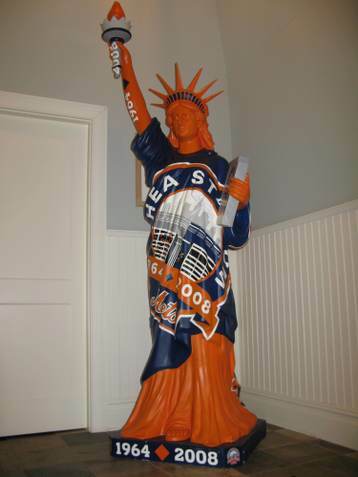 After the parade of statues, each one was auctioned off to raise money for the Major League Baseball charities. How could BF and I pass up this opportunity to help others? We knew Liberty Shea had to live at our home, and after a bit of angst and worry, it became official - we had a new member of the household. Today was officially the last game at Shea. I'm so sorry to say that the Mets said good-bye with a whimper. But just the same, Shea has been home to many great memories for us. We hope Citi Field will bring our beloved Mets more luck. Go Mets! BF and I went to the Mets game tonight with Ms. Judy. We had a blast celebrating BF's big day. Judy and I happened to catch Mr. Met and we snapped a photo of Mr. Met and Major Knitter with the Kaffe Fassett Floral Jacket. Could life get any better than this?